Science Committee Chairman Don Fuqua had a longstanding interest in the U.S. space program. 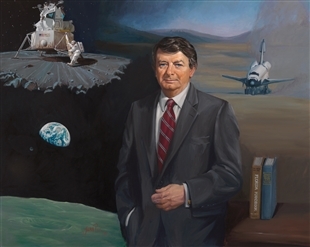 Appropriately, space related events are prominent in his portrait. The upper left portion of the canvas depicts the first, manned lunar landing in 1969. Below it, artist Jean Pilk reproduced one of the first images of the Earth from the moon. In the upper right, Columbia completes the first space shuttle mission, touching down on a dry lakebed at Edwards Airforce Base in California, in 1981. 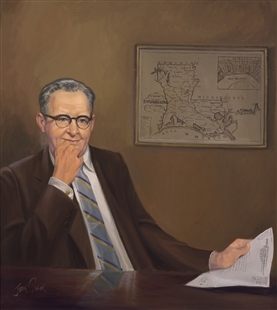 In the lower right two books, emblematic of Fuqua’s own career—the Florida Handbook and the Congressional Directory—sit at his elbow.